In our introductory posting of this series, we noted that economic incentives previously aligning doctor-hospital interests were changing. This creates the potential for The 100 Year Shift – physicians awakening to possibilities for stronger partnerships with payers than with hospitals. Hospital as revenue center: use of hospital resources — driven by admissions, ER visits and procedures — is economically “good” for both hospitals and physicians. More hospital volume means more revenues. Hospital as cost center: as financial risk is shifted to providers, use of hospital resources increasingly is “bad.” More hospital volume means more expense. Let’s take long-look back at the model of hospital as physicians’ workshop, both from the hospital POV and physicians’ POV. Traditionally, community hospitals have served as the “physician’s workshop.” Hospitals provide equipment and staff that enable physician to perform procedures and provide services that they could not readily offer in their own offices. In return, physicians agree to serve without compensation on medical staff committees and to share on-call responsibilities for emergency department (ED) patients who need consultation or admission, or both. For many physicians, these responsibilities were not seen merely as a quid pro quo but also as a manifestation of community pride in their local hospital and of professional ethics in providing care for those who needed it. Economic incentives from hospitals’ POV. For the most part, economic incentives for hospitals have equated more patient volume (admissions, ER visits, procedures) with greater hospital revenues. From having worked in hospitals, we understand that hospitals administrators have tended look at higher patient volumes as desirable. Most hospitals have focused their marketing efforts on physicians, not patients. Physician recruitment company Merritt Hawkins documents the amount of revenue generated per physician. In the 2010 Physician Revenue Survey, they report that the average primary care physician generates $1.4 million and the average specialist generates $1.6 million in revenues. At the high end, an average neurosurgeon generates $2.8 million in revenues. Under Stark anti-referral laws hospitals cannot directly pay physicians to admit patients. However, it has been common to provide economic incentives to entice physicians: recruitment bonuses, office space convenient to the hospital, free or reduced initial rent, and medical directorships are examples. Economic incentives from physicians’ POV. In the past, physicians and hospitals have benefited from mutually supportive economic interests. Doctors received great indirect benefits under the model of hospital as physicians’ workshop. Physicians benefited from affiliating with financially sound hospitals. Physicians needed hospital services provided to their patients, relied on the capital equipment and technology purchases and benefited from the convenience of 24×7×365 hospital availability. Physicians also received credibility and prestige from having medical staff privileges. Physicians have viewed hospital costs as an economic “externality,” or a cost that they do not bear directly. Under fee-for-service payments physicians order services, but a 3rd party payer and the patient pay the bills. Under the model of hospital as physicians’ workshop, physicians also have had no direct incentives to control hospital costs, i.e., using hospital resources effectively and efficiently. Now, let’s take a short-look back at the recent trend of hospitals acquiring physician practices. . Acquiring Physicians Practices – Hospitals’ POV. It has been widely reported that hospitals have again been acquiring physician practices over the past few years. Merritt Hawkins recently found that “Hospitals continue to employ physicians in ever greater numbers.” 56% of Merritt Hawkins physician search assignments in 2010/11 featured hospital employment of the physician, up from 51% the previous year and up from 23% in 2005/06. Accenture predicts that by 2013 only 33% of physicians will remain independent. Hospitals are seeking to align with physicians in response to healthcare reform, which is promoting the use of Accountable Care Organizations (ACOs), bundled payments and other physician-aligned and integrated delivery mechanisms. 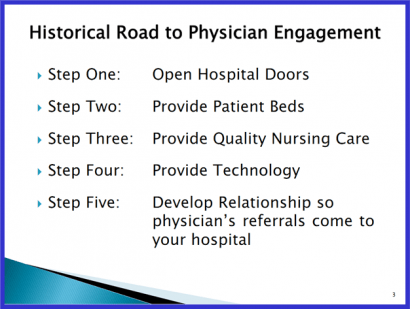 For a deeper understanding of the up-to-the-minute rationale for hospital employment of physicians, we refer you a June 2011 conference summary – Physician-Hospital Alignment Strategies [large file]. See especially presentations by Michael Blau of Foley & Lardner and Rob Lazerow of The Advisory Board Company. Stability in a business environment made uncertain by developments such as payment reforms. This tells us that the physicians’ motivations are primarily defensive – driven by personal fear and insecurity about the future, not by intrinsic motivations to provide better care for their patients. Increases in outpatient care. Physicians’ reliance on hospitals to care for their patients continues to decline as an ever larger proportion of tests and procedures can be performed safely on an outpatient basis. New technologies and services are enabling physicians to care for patients who never see the inside of a hospital. Competition over ambulatory services. Hospitals and physicians increasingly view each other as competitors in ambulatory services and outpatient testing. Hospitalists. Employed hospitalists do much work previously done by community physicians. As a result, more and more physicians have little reason to visit the hospital, which further weakens relationships. Competition over hiring physicians. Physician groups view hospitals as competitors in hiring physicians. Burdens of medical staff membership. The benefits of hospital staff membership for physicians have eroded. One visible irritant is ER call duties, which traditionally are linked to medical staff membership. Memories of previously failed hospital employment of physicians. Many physicians haven’t forgotten the hospitals’ bungled attempts in the 1990s to hire physicians. First, hospitals will have to turn themselves inside-out to shift from revenue center to cost center. This will be difficult and will take time. The initial major change that has to occur is in the mindset of the hospital Board and top management. That’s not easy, and we wonder how many hospitals have truly made this mindset change. But that’s just the start. There are many further layers of systems, policies and procedures that have accumulated over decades of operating under the old model of physicians’ workshop. How quickly can hospitals change? Today’s successful integrated delivery systems – Geisinger, Kaiser, Group Health of Puget Sound, Intermountain Healthcare – have been built over the course of decades, not years. Second, many hospitals don’t have in-house expertise to manage physicians. Many hospitals’ efforts to hire physicians failed in the 1990s, which required painful unwinding. As a result of these marketplace changes, L.E.K.’s analysis indicates that the percentage of net hospital patient revenue from commercially insured plans will drop by more than half while Medicaid, the most unprofitable payer for most hospitals will expand 10% (see Figure 2). L.E.K. also forecasts that the percentage of total reimbursements from Medicare will grow approximately 15%, driven by seniors aging into the program. Based on this insight, L.E.K. projects that reform will place significant financial pressure on hospitals and health systems, transforming them from slightly profitable entities today to operating at annual net losses in the future. Current discussions in Washington DC to resolve the national debt crisis could target even further cuts for hospitals and physicians. Sixth, hospitals’ are being conflicted between the need to affiliate with physicians and the need to increase productivity. Many hospitals recognize that hiring a physician is only a first step and that it will take time and effort to assimilate them into the team. In turn, hospitals address this need by providing management training and education to physicians, requiring that they serve on hospital committees, and by exposing them to leadership development opportunities. All this takes time – putting further pressure on physicians’ abilities to be productive and take care of patients. As quipped by Jeff Goldsmith, the risk here is that the physicians’ workshop becomes the physicians’ sweatshop. Also, the formula for successful “lock-in” of physicians is changing. In the past, the economic incentive for hospitals to lock-in physicians was increased revenues from patient referrals. We wonder how much of today’s physician employment trend is reflexive behavior based on outdated assumptions. The uncertainties and market forces driving hospitals and physicians to consider stronger affiliation and/or integration options also contribute to the sense of urgency. Exploring options such as ACOs, JVs, and gain sharing programs to align incentives takes time. The immediacy of the current forces are driving the most prevalent form of integration seen in the market today which is physician employment by hospitals and health systems. Another fallacy is that forming an ACO, particularly built around an employed physician model will “solve” a physician hospital alignment problem. Nothing could be further from the truth. If a hospital’s goals, vision and incentives aren’t already aligned with the medical staff, the employment/ACO model not only won’t fix it – some realize that an ACO probably won’t work! There are many impediments to a happy physician-hospital marriage. The recent purchase of doctors’ practices by many hospitals is much more a short-term, economically based marriage of convenience than a marriage based on true love. This has profound implications for future of the health care, which we will explore in future posts. Next Post Who Is The Fattest Of Them All? Excellent post- you do a nice job highlighting the fact that merely employing the physicians is just the start- truly integrating them into the hospital system while it is changing from profit-center to cost-center is a daunting task. This is especially true when the person (the doc) being integrated is a fiercely independent and stubborn as can be and when the system that is trying to change has no track record of showing such competency. Excellent points.